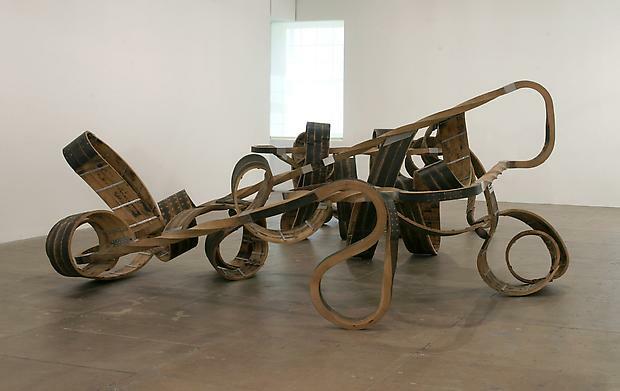 Opening reception: Wednesday, September 8th, 6-8 p.m.
Marian Goodman Gallery is delighted to announce an exhibition of new sculpture by Richard Deacon which will open to the public on Wednesday, September 8th and will run through Thursday, October 7th. A reception for the artist will be held on Wednesday, September 8th, from 6 -8 pm. Gallery hours are Monday through Saturday, from 10 am to 6 pm. 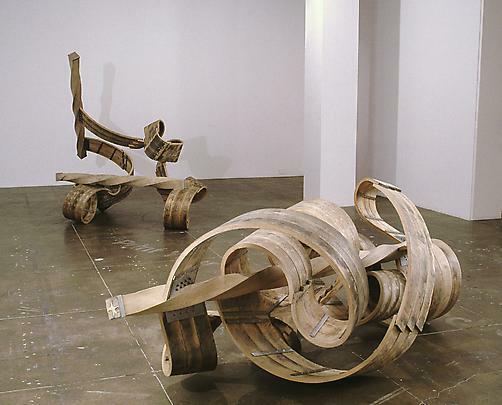 The exhibition will include a major work in two parts, Red Sea Crossing, which was originally shown in the Atelier Brancusi at the Pompidou Centre, Paris in 2003-2004 and is being shown in the U.S. for the first time. Two other new wooden works, titled Individual and Couple, will be shown. 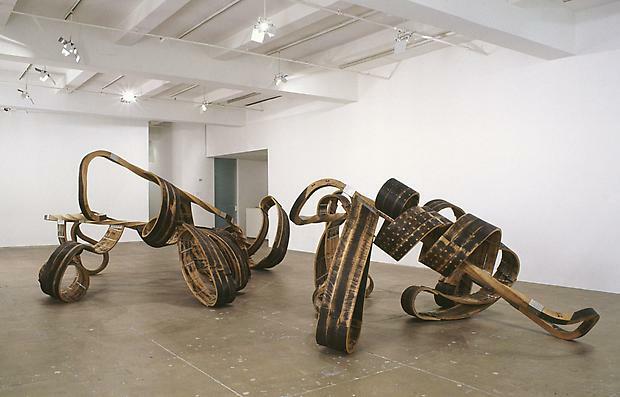 Each of these, as the artist explains "are organized around a complex, twisted piece of wood which, rather than forming a perimeter, is a core which generates a zone of influence (in one case) and separation (in the other)". Also on view will be a set of stainless steel wall works continuing the development of a series of sculptures (titled Infinity) first seen in New York at an outdoor exhibition at PS-1 in 2001, and a display table whose objects have all been selected by the artist by virtue of their resemblance to other things. 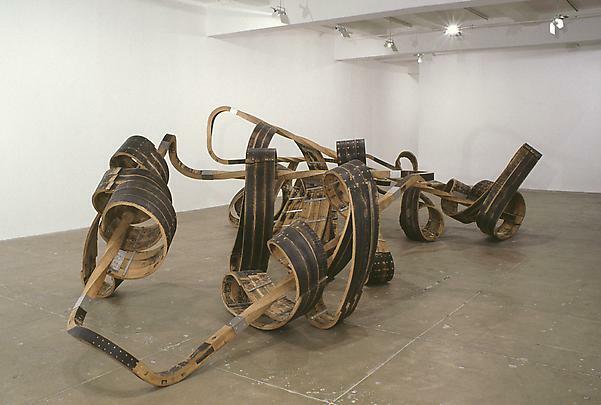 Richard Deacon is best known for his interest in materials and their manipulation and for his innovative use of open form, from which come curvilinear structures with non-rectilinear junctures which have transformed public sculpture. As Deacon says, "What seems to me particularly interesting in the rolling, twisting, bending operations with material [is] that the enclosure or volume created [has] nothing to do with weight or mass, it is empty and therefore connected to meaning in a way that is independent of causality or rationality (that is to say that the outside is not caused by the inside)." 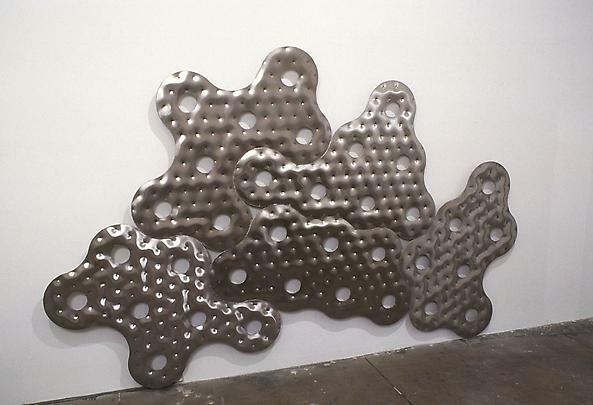 Through an articulation of context, language, and interior space, his works are typically autonomous, often separated from the ground by curved points of contact, while endorsing an interactive social space. The works currently on view in bent wood highlight the artist's virtuosity and his interest in the plasticity with which the material is treated. 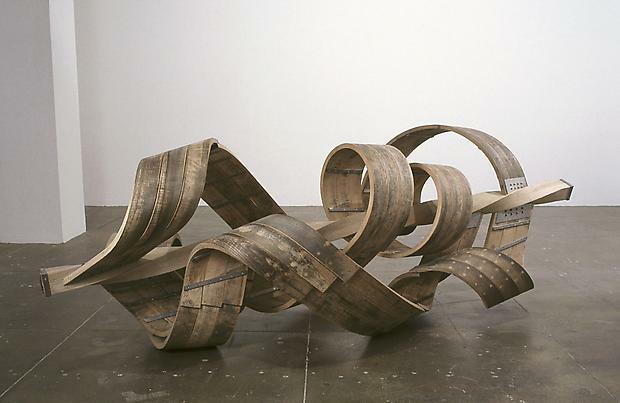 Born in Bangor, Wales in 1949, Richard Deacon lives and works in London. He received a M.A. 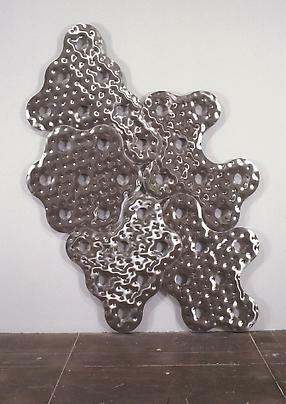 at the Chelsea School of Art, London (1977-78), a B.A. from the Royal College of Art, London (1974-1977), and attended St. Martin's, London (1969-1972) and Somerset College of Art, Taunton (1968-1969). He was awarded the prestigious Turner Prize, Tate Gallery, London in 1987, and currently teaches at the Ecole des Beaux Arts in Paris. His work can currently be seen in Lead Astray: New Shared Sculptures by Bill Woodrow and Richard Deacon, at the Palacio Nacional de Queluz, Lisbon through September 5th, and in A Secret History of Clay: from Gauguin to Gormley, at Tate Liverpool, England. 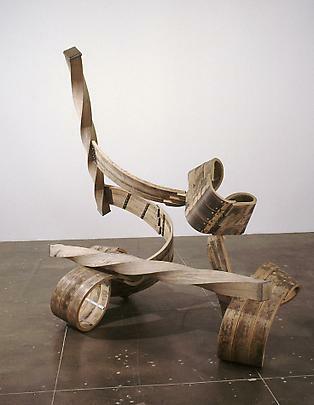 His many important one-man exhibitions include solo shows at the Atelier Brancusi, Centre Georges Pompidou, Paris; the Museum Ludwig, Cologne, Germany; PS-1 Institute for Art and Urban Resources, Long Island City, New York; Dundee Contemporary Arts, Dundee, Scotland; Tate Liverpool, England; Museum Haus Lange and Haus Esters, Krefeld, Germany; Kunstnernes Hus, Oslo; the Whitechapel Art Gallery, London; ARC/ Musee d'Art Moderne del la Ville de Paris; Carnegie Museum of Art, Pittsburgh; Art Gallery of Ontario, Toronto; and The Museum of Contemporary Art, Los Angeles. 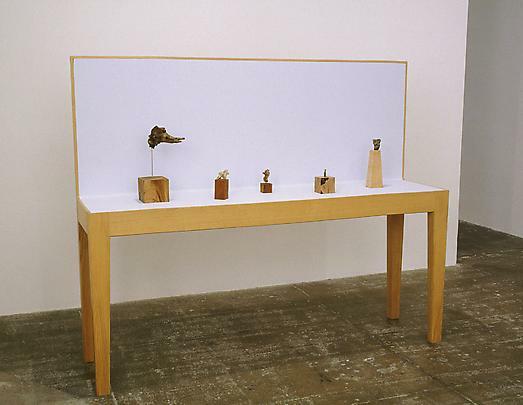 In 1996-97 the British Council sponsored a survey exhibition of Richard Deacons work touring South America, starting in Caracas, Venezuela and moving to Havana,, Buenos Aires, Santiago de Chile and Mexico City. 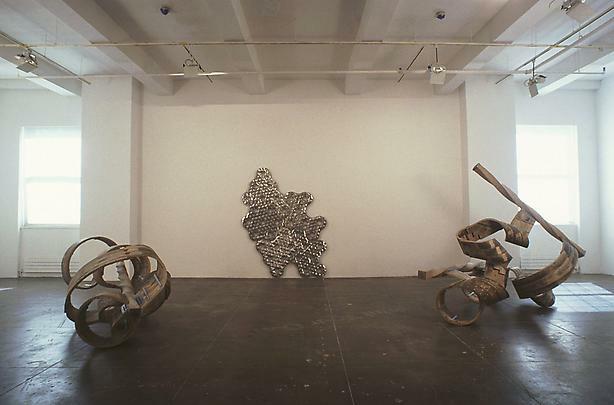 In 1987, a comprehensive survey of Deacon's sculpture toured throughout Europe to Fundacion Caja de Pensiones in Madrid, the Bonnefantenmuseum, Masstricht, the Kunstmuseum, Lucerne, and the Museum van Hedendaagse Kunst, Antwerp. He has participated in countless distinguished group exhibitions, such as the Triennial 2003, Tate Britain, London 2003; Documenta IX, Kassel (1992); Skulptur Projekte Münster, Westfalisches Landesmuseum, Münster (1997 and 1987); Sonsbeck '86, International Sculpture Exhibition, Arnhem, The Netherlands; the Carnegie International (1991 and 1985); Transformations in Sculpture, Solomon R. Guggenheim Museum, New York; New Art, Tate Gallery, London (1983), and countless others. Deacon's many public commissons include Not Out of the Woods Yet (2003), San Francisco; Can't See the Wood for the Trees (2002) Haarlem, The Netherlands; Just Us (2000) Beijing, China; How Much Does Your Mind Weigh? (1999) Millenium Dome, Greenwich, U.K.; No Stone Unturned (1999) Liestal, Switzerland; One is Asleep, One is Awake (1996) Tokyo International Forum Building, Tokyo; Zeitweise (1993), Vienna; Between Fiction and Fact (1992), Musee d'art moderne, Villeneuve d'Asq, France; Building From the Inside (1992), Krefeld, Germany; This is Not A Story (1992), Waiblingen, Germany; Nobody Here But Us (1991) Aukland, New Zealand; Between the Eyes (1991) Toronto, Canada; Once Upon a Time (1991) Gateshead, England; and Moor (1991), Plymouth, England. 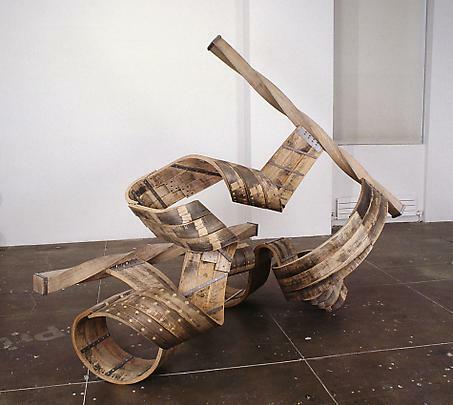 A monograph on the artist, Richard Deacon (Phaidon Press Ltd, London), first published in 1995 and expanded and revised in 2000, will be available during the exhibition.